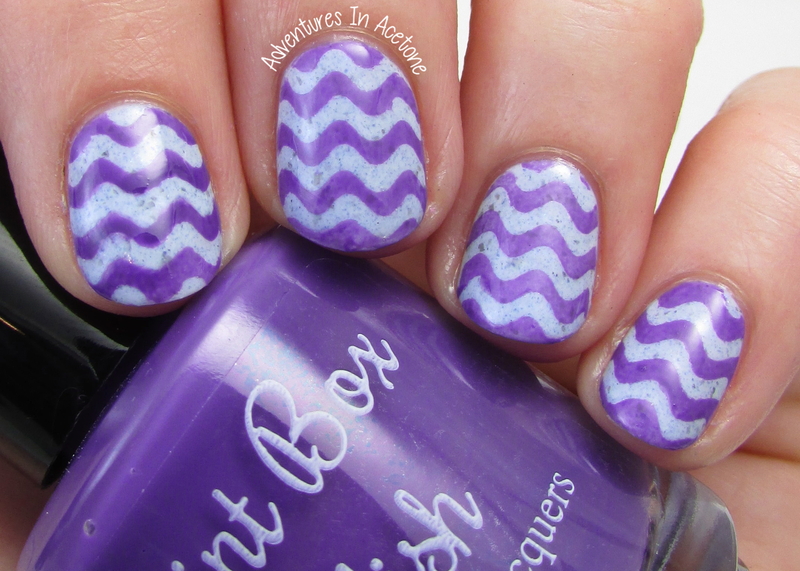 Wavy Nail Art with Paint Box Polish The Knight Bus Collection! Good afternoon, readers! Where are my fellow Harry Potter fans? 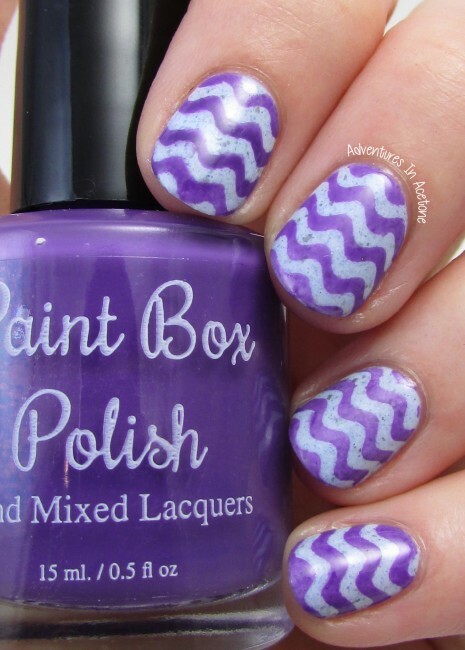 Raise your hands and get excited for the newest collection from Paint Box Polish! The Knight Bus Collection releases this Saturday, November 7th at Noon EST and I will post my Swatch Saturday post on release day of the entire collection. Today, however, I wanted to share an easy nail art look I wore with two of the new colors. I used the Wave Stencils from Stick It! Nail Vinyls so this was a really quick and eye catching mani to wear. I started out with two coats of Paint Box Polish Won’t the Muggles See Us? and topped with a coat of quick dry top coat. Once it was dry for a while, I applied a Stick It! Wave Stencil to each nail and pressed down gently. Then, I sponged on a few layers of Paint Box Polish The Knight Bus over the entire nail. Before they were completely dry, I peeled up the wave stencils to reveal the wave design. After some cleanup, I added a coat of KBShimmer Clearly On Top to seal in the design. How fun are these two paired together? I am a huge Harry Potter fan and was thrilled to see that Pam was releasing another HP inspired collection. I also love The Knight Bus and the collection is great. Come back on Saturday to see my swatches of all 4 new colors, plus a bonus new cuticle oil scent! Paint Box Polish The Knight Bus Collection releases on Saturday, November 7th 2015 at 12 noon EST. Don’t forget my **20% off COUPON CODE: ACETONE** when you make your order! *The polishes used in this post were sent for me to review with my honest opinion.